After yesterday’s National Wild Horse & Burro Adoption Day affording the opportunity for so many of our mustangs and burros to be loaded up to head out across the country to their new homes - as well as concerns about BLMs new trial program being exclusively conducted in the slaughterbelt hubs of Texas, New Mexico, Oklahoma and Kansas billed as, “$500 Wild Horse Adoption Incentive Program”, which gives our wild ones away for free then cuts the new owners a $500.00 check after one year (with compliance checks historically being as low as 5% nationally) – understanding BLM’s branding system may be an important tool in helping the public to protect America’s mustangs and burros. Posted below are a variety of photos taken from BLMs holding facilities to help illustrate the different kinds of brands BLM uses to identify wild horses, because as it turns out, it’s not just a simple freezebrand mark on the neck anymore. There are different brands that identify “For Sale” horses, Long-Term Holding Horses, Fertility Control Mares being held at facilities that may or may not be returned to the range at a later date (?) and with the new slew of BLM management proposals recently approving adding geldings to the free-roaming herds – with new brands for those as well – advocates need to begin to understand what they are looking at. In addition to the photos, a variety of advocates have been posing questions to BLM officials regarding “what” these brands mean. Posted below the photos are various answers received from officials. Apparently, BLM personnel needs to get on the same page and understand what they are looking at as well as some of these responses presented contradictory information. Now all we have to do is figure out which one is telling the truth! This post is designed to be a work in progress. If you have additional brand photos you would like to add, please contact Valerie James Patton at valerie_jamespatton@yahoo.com. American Herds would also like to encourage everyone to add your own stories or experiences regarding BLM brands, adoptions, sales, etc. in the comment section in order to help advocates have a working database of what is going in the BLM National Wild Horse & Burro Program. After receiving many of the above photos, Wild Horse & Burro and anti-slaughter advocate Valerie James Patton began inquiring as to the nature of these brands. 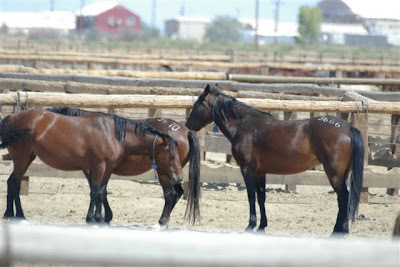 On Thursday, September 24, 2009, she contacted Timothy Green of Nevada’s Palomino Valley Holding Facility by phone to question Mr. Green regarding the meaning of these brands. Based on his responses, she sent out the following information later that day with a request to cross-post widely. I've attached 5 pictures that were taken September 6th, 2009. 4 of these pictures are from Snow's BLM facility, and 1 was taken at the Palomino Valley BLM facility. The picture of the brand # 5634 was taken at Palomino Valley, and all others were taken at Snow's. Some of the brands on these horses are very unusual, and while I've known that the 4 digit rump brands are for horses destined for long term holding facilities given to horses that are considered unadoptable, I've never seen horses branded with the AB before. 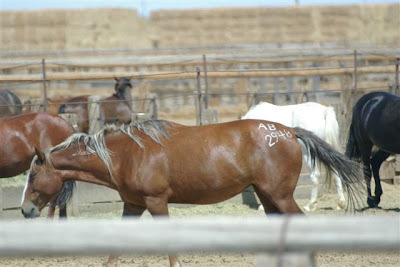 Some of these horses are branded only with the AB, some are branded with AB and the 4 digits, and some are the 4 digits only. The 4 digit rump brands match the last 4 digits of the freeze brand on the neck. I called Snow's facility yesterday, and the woman who called me back this morning, stated she had no idea what the brands were, but these were brands BLM is using on the horses. 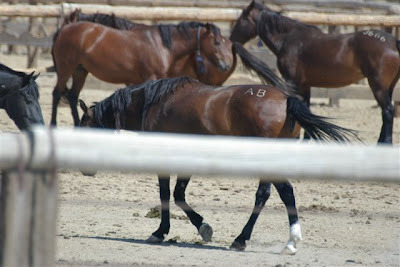 I contacted Palomino Valley just a while ago, and spoke to the person in charge of brands, Timothy Green, and he said that the AB is branded on mares that have been injected with PZP. 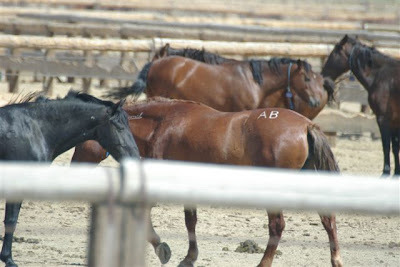 Some that do not have the 4 digits are returned to the range, and others that have the AB and the 4 digits, were mares that had been previously gathered and injected with PZP, returned to the range, then regathered and branded with the 4 digits to show that they were now sale authority or horses headed to long term holding. He said that horses between 5 & 10 years old, were sale authority horses, and any horse past the age of 10 were intended for long term holding, and would not be available for sale or adoption.I asked him about the extended U on the neck brand, which used to be the sale authority brand, and he wasn't aware of the brand. I have seen pictures of the brand, and I have a letter from Dean Bolstad of BLM, that states the U is branded on sale authority horses only. 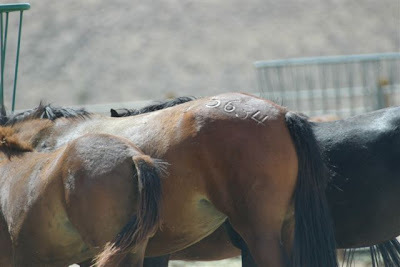 I was also previously told that the 4 digit rump brand was not branded on sale authority horses, but only branded on horses intended for long term holding that would not ever be for sale or adoption, but according to Mr. Green, BLM changes the way they do the branding often, and this must have been one of the changes. There's been quite a bit of concern about horses leaving the long term facilities for slaughter, and knowing what these brands look like will help track them. I sent a couple of these pictures to a few people the other day, and one person who attends both auctions and feedlots, has written back and said they have seen horses with the AB before, but couldn't remember where. I do have several more of these pictures, and they will be up on the American Herds blogspot in the next couple of days, along with any more information about the brands that I can find out about. If anyone else would like to see more of these pictures, let me know. So I'm sending these pictures out to everyone because I doubt that if anyone was to see these brands on these horses, they would be able to recognize that these were BLM horses. 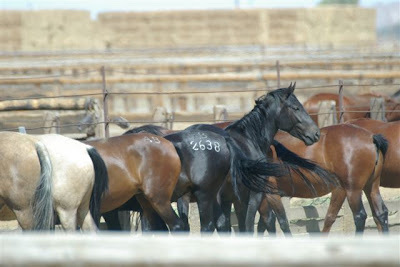 I hope that rescues and anyone that attends auctions, feedlots, or sees horses in the export pens along the borders will be able to recognize that these are BLM horses, so please crosspost this information and those of you with websites, please post these pictures to help get the word out. In response to Ms. Pattons request to cross-post this information, other advocates sent additional requests for information to various BLM officials about these brands as well. This was the reply received from BLMs Public Affairs Specialist Tom Gorey on Friday, September 25, 2009. BLMs official responses are posted in capitol letters and highlighted in bold. Some of the brands on these horses are very unusual, and while I've known that the 4 digit rump brands are for horses destined for long term holding [YES] facilities given to horses that are considered unadoptable, I've never seen horses branded with the AB before. Some of these horses are branded only with the AB, some are branded with AB and the 4 digits, and some are the 4 digits only. The 4 digit rump brands match the last 4 digits of the freeze brand on the neck. I asked him about the extended U on the neck brand, which used to be the sale authority brand, (Embedded image moved to file: pic12292.jpg) [THE BIG U IS THE ONLY BRAND THAT DESIGNATES SALE AUTHORITY] and he wasn't aware of the brand. I have seen pictures of the brand, and I have a letter from Dean Bolstad of BLM, that states the U is branded on sale authority horses only. I was also previously told that the 4 digit rump brand was not branded on sale authority horses, [NO, THEY CAN BE BOTH SALE AUTHORITY AND LONG-TERM HOLDING] but only branded on horses intended for long term holding that would not ever be for sale or adoption, but according to Mr. Green, BLM changes the way they do the branding often, and this must have been one of the changes. There's been quite a bit of concern about horses leaving the long term facilities for slaughter, [A CONSPIRACY THEORY THAT IS FALSE] and knowing what these brands look like will help track them. On Friday, September 25, 2009, the day after talking with Ms. Patton, Timothy Green contacted her by phone to apologize and correct some of the information he had given to her the day before. Pasted below is his email reply in its entirety. Sent: Friday, September 25, 2009 2:22 p.m. When the mustangs are gathered they are usually put into three different categories. The first category is adoptable which is mare with foal, weaners, yearlings, and 2 to 4 year old horses. Their freezemark is a "U" followed by 8 marks that indicate their age (first 2 marks), series (second two marks) and the horse number (the last four marks) which are the actualnumber or tag number for the horse. The second category is the 5 to 10 year old horses which are marked with the freezemark on the neck and a 4 digit number on the left hip. These horses may or may not have a large U on the hip. The third category is the 11 years and older which has the regular freezemark on the neck and a large U fright after it. It would look something like this - regular size u followed by eight symbols and that followed by a big U.The hip mark indicates that the horse is 5 or older and when this is followed by a large U it is identified as being a sale authority horse (11 and older). There are always exceptions to this and the one that stands out is in the 5 to 10 year olds that, even going to a long term holding facility, may be adoptable so they will be given just the standard neck brand. You may also see some mares that have a a large AB on their hip. 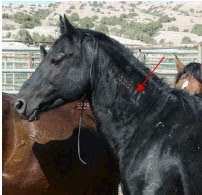 This is to identify the mare as having been injected with PZP for birth control. 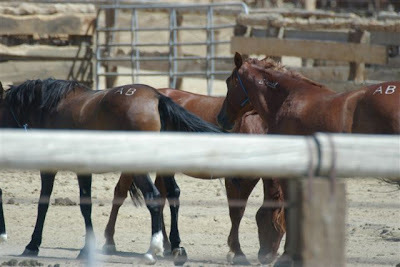 These mares may have been captured in 2001, given PZP and then released back to the herd. When a new gather is done at a later date 2009, thissame mare may be gathered again, only this time she will be brought into the facility for processing. Sent: Friday, September 25, 2009 11:15 a.m.
You just caught me before I head out the door for the National Adoption day tomorrow. We have 4 events going on here in Utah and will hopefully find good homes for as many animals as possible. Each animal that is removed from public land is given an "alpha angle freezemark" that consists of the "U" and 8 angles. This is the mark that most folks are familiar with. All animals adopted or sold have this freezemark. Any "Sale" animals have a "U" (when I say, "U" - this is actually a square u with two bars off the side. It's a government registered mark that is nationally in all state brand books) near the freeze mark. Below is some specific information on this. All new sale eligible animals removed from the range will be marked with the standard alpha angle animal identification freeze mark applied to the left side of the neck. In addition to the standard identification freeze mark, all sale eligible animals will be freezemarked with a 3-inch (Embedded image moved to file: pic25721.jpg) symbol on the left side of the neck to distinguish between animals that are sold and those adopted. The new mark should be placed immediately to the right, adjacent to and on the same level as the identification freezemark. 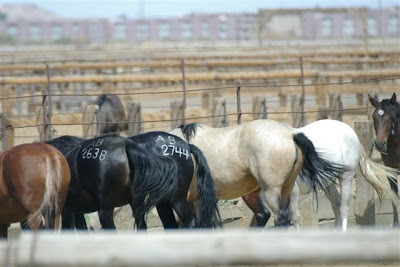 This may not be possible in a few situations and alternative placement locations inorder of preference are first, below the identification freeze mark and second above.Four digit hip numbers will not be applied to sale eligible animals unless they are going to be shipped to long-term holding. The fertility control mares in the photos are usually not removed from the range. However, "unforeseen circumstances" may warrant their removal (ie: wildfire, lack of available forage or water, etc.). The below paragraph is our current policy. Wild horse mares treated with PZP will be maintained in their Herd Management Area (HMA) a minimum of three-years following treatment. 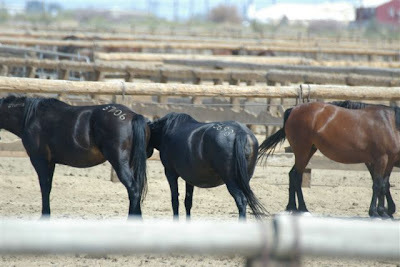 In the vast majority of cases, the released mares will never be gathered sooner than the mandatory three-year holding period. 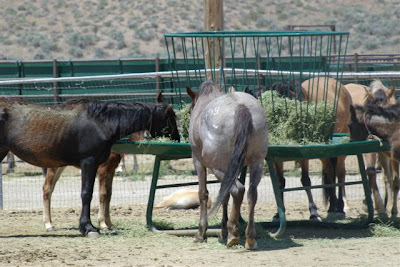 In those rare instances when, due to unforeseen circumstances, a treated mare(s) is removed, they will be maintained either in a BLM facility or contracted Long Term Holding Facility until expiration of the three-year holding period. All treated mares in population-based treatments will be freeze-marked on the hip for identification purposes. A two-letter freeze mark assigned by NPO will be applied to the left hip of each treated mare in Population Based Trials. The two letters represent -- the first letter is the year of the fertility control trial (ie: A), and the second letter is the trial area (ie: B); thus you have an AB on the hip. Our National program office keep the data on these assignment of which two digit lettering is applied at what locations. BLMs responses are in italics. Sent: Tuesday, February 12, 2008 7:49 a.m.
See the following answers to your questions. 1. WHY are 2 year olds setting in long term holding facilities? The horses in the internet adoption picture that you called my attention to were born at a Long Term Holding facility as a result of pregnant mares that were placed in long term holding after capture.These horses in the picture were born during the spring of 2006, removed from the long term holding facility for weaning during the fall of 2006, and placed in short term holding where they have been waiting adoption. They are currently about 21 months old. 2. Why were they taken OUT of long term holding facilities? Has there been a sufficient amount of adoptions that BLM can start bringing long-term horses out and offer them another chance? They were removed from long term holding as weanlings at about 7 months of age for two reasons. 1) The stud colts can not be allowed to stay with the mares as they would begin to breed if they weren't removed. 2) Weanlings are the most adoptable age group of horses. 3. It also got me wondering.....how does BLM distinguish a long term horse or burro from any other? Do you do a different signature on the freezebrands? It is my understanding that some horses are immediately identified to be shipped to long term holding facilities (age obviously the key factor). This is correct, yes? Does BLM mark them right there during processing for long term holding after the gathers? What/how do they do it? Does BLM have a way of identifying what a "For Sale" horse is that is different from others and if so, what is it? 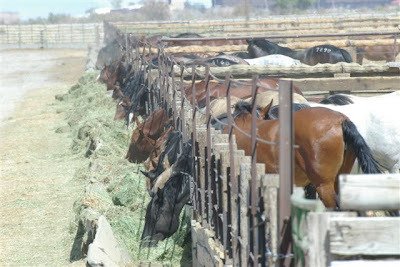 Most horses five and older are shipped to long term holding because there is little adoption demand. Depending on available space at short term holding corrals, some three and four year olds have been shipped to long term holding. 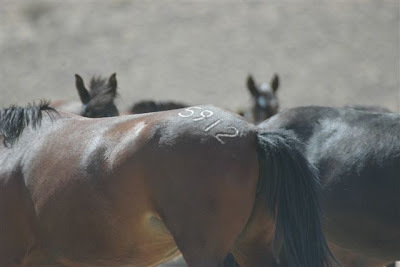 The BLM marks almost all horses bound for long term holding with a four number left hip mark that correlates with the last four numbers of the animal's freezemark. Some three and four year olds shipped to long term holding have not been hip marked because we thought there might be an opportunity to adopt them. 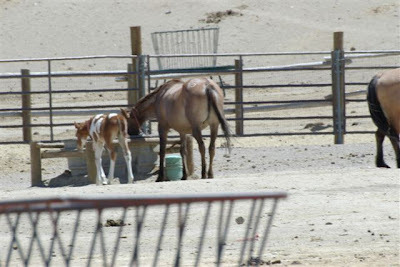 About ten, two year olds have been sent to long term holding that have deformities that are not life threatening, but that render them unappealing to most adopters.We have not sent any burros to long term holding.All sale eligible horses that are 11 years old and older are marked with a three inch "U" freezemark immediately to the right of their traditional BLM freezemark. This following email exhange has only been copied for its relevant portions regarding the subject of brands, sanctuary’s and horses being sold. Thank you for your inquiry. All horses that are sent to long term holding are freezebranded on their hip with their last four identification numbers. It allows them to be identified from a distance. If you have any further questions, please feel free to contact me. Thank you so much for your answer Amy. I was under the impression that a long term holding facility meant that the horse could not be sold, am I wrong? I only have part of the paperwork on this horse who's ID number is 95213955 but at the top of her paperwork is a number that is hand written, it is 5581 but the number 5578 is marked out, could this mean she had a foal also? Much of her paperwork is missing or lost but in research I know she came from CA and was sent to KS, then sold. How can I find out who she was sold to or where this person was from and if she had a foal if the foal was sold with her? I need to understand her history in order to figure out how to bond with her in the best way for her. 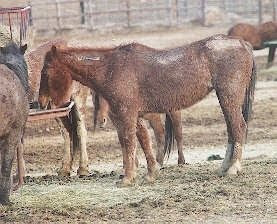 This mare was gathered in July 2001 from the Twin Peaks HMA in northeastern California. After being prepared, she was shipped to a sanctuary location and then sold 4 years later. 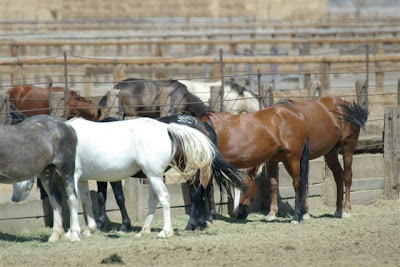 Horses can be sold from sanctuary, but it does not occur frequently, and it usually has to be at least 30 animals. Regarding the numbers on top of the page, I am not sure what those mean. It could have meant she had a foal, but the foal would have been weaned prior to her shipping to sanctuary. I am guessing someone's notes on other horses of interest or someone at the facility matching her with a foal. But again, they would have waited to ship her until the foal was weaned. Under the provisions of the Privacy Act, I am not permitted to tell you who purchased her. If you have any other questions, let me know. Thanks for doing all this research. Just gotta ask, how is having those big, honkin', ugly numbers on a rump going to promote adoption? This blog is a keeper & I'll be posting a link to it on my blog, too. Thanks for the compilation. Choosing AB as a birth control abbreviation was unfortunate. Have read that's a European mark for "abattoir" . Abattoirs specialized in slaughtering animals for human consumption. We might just want to keep an eye on those horses so that there's no misunderstanding. Senator Feinstein: A Woman of Her Word?